For immediate release: 1 December 2009, Rarotonga, COOK ISLANDS: Three Pacific journalists have been part of a new ‘media myth busters’ initiative launched this week by the Pacific WAVE Media Network. FM news network director Titi Gabi of Papua New Guinea and television documentary producer Shona Pitt of the Cook Islands feature in the media myth buster’s inaugural brochure which folds out into a full colour poster. After its online debut, the poster will make its way as a full-colour print version into Pacific newsrooms. Lisa Williams-Lahari, a founding member of WAVE who also leads the networks advocacy on gender and HIV/AIDS, says the peer-advocacy initiative aims to make the most of real experiences from Pacific contexts. She says journalists responding to a WAVE online survey earlier this year, had identified newsroom resources as something they would like to see more of. “World AIDS Day is more than bumping up programs, advertising and content for 24 hours or a few days in December. It can also provide a space for journalists to talk about what they are getting right in coverage – and share ideas on how we fix what needs fixing,” says Williams-Lahari. “Media myth busters essentially allow us a non-confronting way to start challenging the way we see and report our worlds. Tapping into personal experience, especially based on professional experience, is just an idea we wanted to develop in a cost-effective way. We had interest from our male colleagues in being part of this project but with daily news deadlines it’s hard to keep advocacy a priority. We’re pleased to begin the initiative with HIV/AIDS and aim to keep up the momentum on other issues where myth busting is also important,” she says. “Speculation and myths often emerge when people don’t have access to the facts,” says Papua New Guinea journalist Titi Gabi. Gabi addresses the myth of miracle healings via new remedies or evangelical healing, challenging news colleagues to get medical balance to stories on miracle cures for HIV/AIDS to help save lives. Assumptions around gender being all about women also need to be dealt with, and form the third myth ‘busted’ by Williams-Lahari. “It will be good to see media myth buster resources in a lot of other areas and events, and we are developing our VAW, climate change, and media freedom myth busters for 2010,” she says. Support came from four key partners in getting a campaign on HIV/AIDS off the ground. The Secretariat of the Pacific Community (SPC), the Asia-Pacific Institute for Broadcast Development (AIBD), and UNESCO helped get WAVEmedia members to some brainstorming meetings in July, during the AIBD‘s first Pacific conference in Nadi. Thanks to the Pacific Islands AIDS Foundation, (PIAF) the group attended a post-conference workshop on HIV/AIDS and developed the resource from there with a small grant from PIAF. View the posters above, and to update your mailing details or send a request to increase the allotted numbers of 2 per newsroom, send comment and feedback to info@pacificwave.org before December 10th. SPC’s Human Resource Development Communications Adviser Tione Chinula is the person WAVE works with under this MOU, which has seen SPC supporting WAVE in its website development and visioning/strategic planning work. Ursula Rakova (Carteret Islands, South Pacific). Tulele Peisa executive director Ursula Rakova was born on Han, the main island of the Carterets. After leaving the atoll to study social administration at Papua New Guinea University, she became a pioneer in the environmental movement, working for NGOs such as the Individual and Community Rights Advocacy Forum, Environment Law Centre and Oxfam. At the request of a group of Carteret Island chiefs, Ursula returned home to help form Tulele Peisa, an organization whose mission is to voluntarily relocate 1,700 Carterets Islanders, whose islands and food supply are rapidly eroding, to three safe and secure locations on mainland Bougainville over the next 10 years. She was awarded the Pride of Papua New Guinea award in 2008 for her outstanding contribution to the environment. For Ursula, seeing her ancestral homeland disappear is a hard reality. "In the Carterets land is traditionally owned by women," she says. "My grandmother passed land to my mother and then it came to me. Ten years along the line I would love to pass on this island to my daughter, but I will not be able to do that." 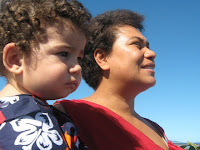 Monday 14th September 2009, Rarotonga, COOK ISLANDS: In a month that is one of the busiest ever in terms of global conferencing on climate change worldwide, Pacific WAVE Media Network Coordinator Ulamila Kurai Wragg (below, with son Ratu Tevita, in Nadi during AIBD in July) heads to New York this week for some intensive lobbying and advocacy with world leaders, on climate change. The freelance journalist who now heads the regional network for Pacific women working in the media, says the focus will be on asking leaders to take personal responsibility to sign a fair, binding and ambitious deal at December’s UN climate change negotiations in Copenhagen.